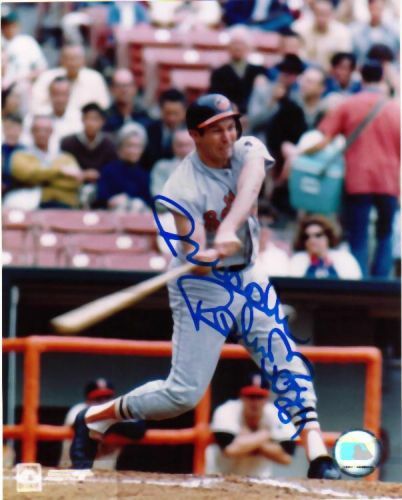 Brooks Robinson (Baltimore Orioles) autographed 8x10 photo. All autographs are 100% guaranteed and this item comes with a certification seal of authenticity from JSA. George Bell (Toronto Blue Jays) autographed 8x10 photo. All autographs are 100% guaranteed and come with a certificate of authenticity from www.RKSportsPromotions.com. Daryl Boston (NY Mets) autographed 8x10 photo. All autographs are 100% guaranteed and come with a certificate of authenticity from www.RKSportsPromotions.com. Don Larsen (NY Yankees) autographed 8x10 photo. All autographs are 100% guaranteed and come with a certificate of authenticity from www.RKSportsPromotions.com. Tim Teufel (NY Mets) autographed 8x10 photo. All autographs are 100% guaranteed and come with a certificate of authenticity from www.RKSportsPromotions.com. Ed Kranepool (NY Mets) autographed 8x10 photo. All autographs are 100% guaranteed and come with a certificate of authenticity from www.RKSportsPromotions.com.